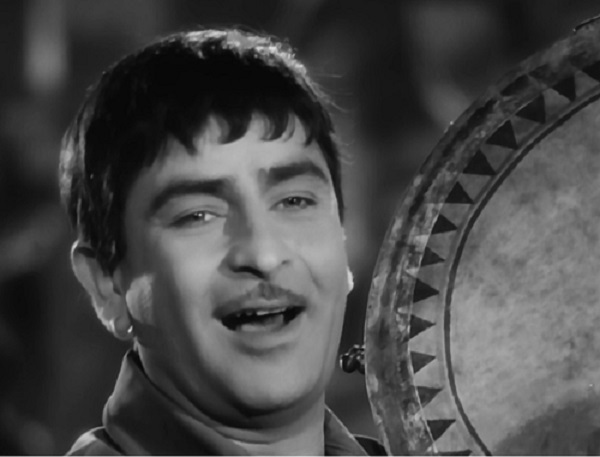 Raj Kapoor: The Showman Inimitable! At the age of 24, Raj Kapoor—also known as “the greatest showman of Indian cinema”—who was born on 14 December 1924—had become the youngest director with his film, Aag. His performance in Awaara was ranked as one of the top 10 greatest performances of all time by Time magazine. It is 29 years ago to this year that Raj Kapoor, India’s showman inimitable, passed away leaving behind a dozen or so films that have traces of neorealism but infused with his unique dream-like narration … for us to relish his optimism and be moving into our tomorrows under its influence…with a liberal outlook … and of course, with lots of love. Raj Kapoor, who started his film-career as a clapper boy at the young age of 11 at Bombay Talkies Ltd., got himself schooled in the aesthetic traditions of theater and cinema. Apparently, it is the films of Hollywood directors like Orson Welles (Citizen Kane, The Magnificent Ambersons), Frank Capra (It’s a Wonderful Life, It Happened One Night), and the directors from Italian neorealist cinema like Roberto Rossellini (Roma citta aperta, Paisan) and Vittoria De Sica of the Bicycle Thieves, Shoeshine and Miracle in Milan that gave him the right scaffolding—the scaffolding that he filled with his own humanist ideology, painted it optimistically in his own colors in his own imaginative way reflecting the very mood of India of those days. The beauty of his cinemas is: there is a certain allegory of hope—hope to redesign tomorrows with love as is reflected in that ever-mesmerizing song aptly penned by his friend Shailendra and sung by the voice of his soul, Mukesh under the baton of Shankar Jaikishan: kisi ki muskurahaton pe ho nisaar (to offer oneself to someone for smiles)—behind his films. Indeed, Raj Kapoor himself once said, “What is it after all that a man wants? ... The basic thing is tomorrow: the knowledge and promise that tomorrow will be better than today. Nothing else matters.” And this is what we experience watching his films, particularly his early films—the very essence of reality infused into his dreamy narration about the upcoming tomorrows steeped in ‘pure love’—in almost all of his films and his film’s songs. Indeed, it is love—pyar dhadakte hai—that beats across the scaffolding of all his films that depict the life and struggles of a common man. One is often tempted to wonder if Raj’s films look ‘Capraesque’, for we come across a fine blend of optimism, humor and patriotism in his films, while darkness, despair and the need to fight for things one cares about flow as their undercurrent. His heroes undergo real suffering but laced with humor, which of course, engenders from the hero’s courage. In Shree 420 (The Gentleman Cheat), when the heroine asks the hero as to why he pretends to be a joker, always fooling around, the hero laughs out saying, “Dil ka dard aur aankhon ke aansoo chhupaane ke liye ye bewaqoof maskare ka bhes bade kaam ke cheez hain”—to hide the heart’s pain and flowing tears from the eyes, the mask of foolishness comes quite handy—and this is what ultimately offers laughter to the audience. He is a great master of creating archetypal personalities as in Awaara (1951), Shree 420 (1955), Jis Desh Men Ganga Behti Hai (1960) to manipulate audience’s feelings and make their throats choke, eyes well up and even give off for a while their own logic to identify themselves with the character on the screen. And Shree 420—that thoroughly fascinating and entertaining film apart from being socially relevant—stands out as a classic example of Raj’s narration of populism at its best appeal. His cinematic imagination well expounds the demonology of populist rhetoric: common people’s distrust of the urban elite that is considered by them as the “conspiratorial forces for the evils of society” and the possibility of its rectification without any fundamental change in the system—all by one’s own redemption. 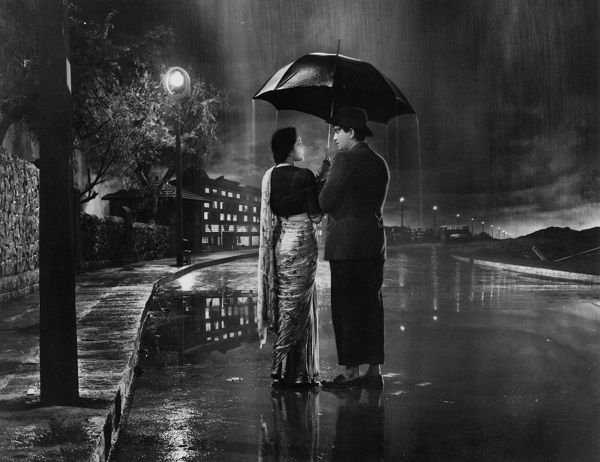 The plot of Shree 420 is simple, but it is Raj Kapoor’s evocative art of narration—which tells us that it is possible to live a decent life without losing oneself and even change the world if only love assumes commanding role—that makes it so interesting to watch. The film begins with a jaunty orphan, Raj (Ranbir), the university educated, coming to Bombay in search of his fortune crooning his song of the road: Mera juta hai Japani ...—My shoes are Japanese, my red hat is Russian, but my heart is Indian …. And as it happens, he fails to get a job. In a pawnshop, he encounters Vidya, a pretty teacher selling her bangles to meet the school expenses. Dreaming of a happy future family, for a few days he works in a laundry shop to earn a decent living and to woo the principled Vidya. This utopian simplicity does not however last long. One day, he meets a high society woman, Maya, who noticing Raju’s knack at playing tricks with cards, lures him to a fancy soiree where she presents him as a Rajkumar (Prince) of Pipalinagar. Thus, begins his fall for luxury and easy money. Becoming a prey to charms greater than himself presented by an unscrupulous and dishonest businessman, Seth Sonachand and the ravishing Maya, Raj becomes a trickster. He perhaps considers his ascent to riches as a revenge against his humiliation. He even wonders: there is nothing wrong with money, for after all it’s only a means for one to be happy. Perhaps, haunted by the question, “why should the poor suffer from their poverty and simultaneously justify their virtuous resignation?” he sees no wrong in his tricking the rich for money and even argues with Vidya that his position is honest and morally acceptable—a blend of realistic problem and imaginary solution that aptly epitomizes middle-class mentality. But Vidya, who was more sympathetic when he was poor and lived close to the earth but being hurt when he joined the criminal forces from the urban elite, standing firm on her principles, attempts to appeal to his faith in plain, decent everyday common rightness but fails. Meanwhile, Seth proposes a Ponzi scheme to exploit the poor by promising them permanent homes. The scheme pays off: the poor lodge their savings with him. Raj, who has by now become rich, realizes that he has paid a very high price for becoming rich. Discovering that Seth has no plans to fulfill his promises to the poor, Raj decides to make the wrong right. Picking up all the bond papers of people’s homes from Seth’s office, Raj tries to flee. But he was caught by Seth’s cronies and in that scuffle Seth shoots Raj. He falls down unconscious. Hearing the shooting, the poor people rush out to see Raj nearly dead. Seth tells police that as Raj was fleeing with the stolen money from his safe he shot him. At it the dead Raj springs back to life and logically proves the wrongs of Seth. Police then arrest Seth and his cronies. Vidya forgives Raj and the film ends on a happy note …. The real beauty of the movie lies in Raj Kapoor executing this simple plot more artistically. His directorial skill expounds populism—the amorphous cluster of ideas centered around the opposition of elite and the common people—quite impressively. A mere look at a couple of episodes from the movie leaves one appreciative of Raj’s creative ingenuity. The conspiracy of money and power against the common people is portrayed in the film quite romantically: as Raj is entertaining his fellow workers by singing the song—Dil ka haal sune dilwala (O good-hearted man, listen to what’s in my heart) / Sidhi si baat na mirch masala (It’s pretty straightforward with no melodrama)… / Aadhi raat ko mat chillana varna pakad lega police wala (Don’t shout in the middle of night / else, the police man will catch you to get it stopped—that so aptly reflects the socialist outlook of the then nation, the Seth (merchant) in the adjacent palace feeling disturbed, summons police to dislodge them. There is another interesting scene, which incidentally is pivotal, for it sows the seed—perhaps, by instilling shame —for Raj to revert to his old self. In one of those days of his romance with the luxury of high Bombay society, Raj staggers drunk from a night club to Vidya’s house. But Vidya, with her strong rooting in ethics, having naught to do with Raj such as he is, turns him down. Hurt by it as Raj staggers back, Vidya watches him standing like a pillar anguish writ large on her face … perhaps, hoping him to look back just for once, to take her in his arms, soothe her ruffled feelings and reassure her, for she is still deeply in love with him. Now, it is to make this intra-conflict of Vidya evident to the audience, Raj simply resorts to a song: a ghost-like tormented Vidya comes out of the rigidly standing mute Vidya and implores at Raj, O jaanewale mud ke zara dekhte jaana (O beloved, looking back you may go) / … / fariyad kar rahi hai khaamosh nigaahe (although I remain silent my eyes implore at you…). As Vidya, the censurer of Raj’s conduct stands still, the ghost runs between them, perhaps, to foster a compromise. That is Raj’s mastery over narration. There is yet another episode, watching which the audience are sure to get carried away. One night, seeing Maya and her world of illusion in the club, and disillusioned by their true nature Raj, finally choosing to get out of the rut, runs away in horror from the club back to the slums. As he is walking fast in dejection on the footpath, we hear from a distance a long ‘wail’ (of Rafi’s) that is so full of depth setting the mood brilliantly for what to follow. His old pals from the slum assembling on the roadside are happily singing a trite ode to love and loss—Ramayya vastavayya (Ramayya, will you return?) / Maine dil tujhko diya (I have given you my heart)—reminding us, and perhaps, Raj as well that poor people can be happy too. As the chorus girls in native dress merrily dance singing “I have given my heart to you”, Raj coming closer to them, and standing transfixed in anguish listens to them. As the lyrics—Nainon me thii pyaar ki roshinii (In your eyes was the light of love) / Teri aankhon me yeh duniyadari na thii (This worldliness wasn’t in your eyes then) / ... Tere mann mein yeh meethi kataari na thi (This sweetened dagger wasn’t in your heart then) / … / Us desh mei tere pardes mei (In that country, in your foreign land) / Sone chandi ke badale mei bikate hai dil (Instead of gold and silver, they sell hearts) / Is gaoon mei dard ki chaaonmei (In this village, in the shadow of pain) / Pyaar ke naam par hii dhadakte hai dil (hearts beat only in the name of love)—sink in, he, realizing that they apply to him and Vidya, and perhaps, as the truth—the truth of the promise that he made to his beloved—stares at him, he gets stirred up. In that rocking, realizing what he has lost and yearning to come back to his old poor but happy life, twitches his lips as though wants to utter something. But the camera pans over the street catching the glimpses of a thelawala, a tanga wala, and then on to a cyclist who catching the tune and humming the catchy words, Ramayya vastavayya transports the song to Vidya’s porch. And Lo! the miracle of the music, contagion, happens: picking up the words, “mera dil tujko diya”, Vidya, sitting in the porch disconsolately, softly airs the words with teary eyes: Yaad aati rahii dil dukhaati rahii (still remember you, my heart still grieves) / Apne man ko manana na aaya hamen (I do not know how to conciliate my mind) / Tu na aaye to kyaa? Bhuul jaaye to kyaa? (If you do not come, so what? If you forget, so what?) / Pyaar karke bhulaana na aaya hamen (having fallen in love I do not know how to make myself forget) / wohii se duur se hii, tuubhi yeh kah de kabhii (Even from far away, say this sometime) / Maine dil tujhko diyaa (I have given you my heart). As Vidya completes airing the words, Maine dil tujhko diya, the camera seamlessly switches back to the street to capture the disillusioned Raj joining his old pals with the words on his lips “Maine dil tujhko diya”, of course, sans the earlier flirtatious banter that a listener noticed between the male and female voices (of Rafi and Lata) but in a truly regretful tone (of Mukesh). Jumping in joy at his return, as the singers invite him into their fold with a hug, Raj, perhaps as testimony of his redemption, continues to sing soulfully, but with a face reflecting lots of relief, Rastaa wohii aur musaafir wohii (the path is the same, the traveler is the same) / Ek taara na jaane kahaan chhup gayaa (But I don’t know where that star has hidden herself) / … koi kyaa jaane kiskaa jahaan lut gayaa (No one knows whose world has been destroyed) … Merii ankho mein rahe kaun jo mujh se kahe? (who once told me to remain forever in their eyes) / Maine dil tujhko diya (I have given you my heart). That is Raj’s poetic vision: A routine song scene has been used to carry forward his narration so effectively to its conclusion: if two hearts are in love, and if they are honest, nothing could separate them. It is through such articulation of optimism, Raj injects movement, life, energy and vibrancy into his films. It is through the clashing of ethics and ambition, love and temptation, innocence and experience that produced humor, pathos and heart-wrenching realism that Raj proved beyond doubt that it is not dishonesty that could eradicate poverty but hard work and honesty. Simply put he asserts: man can redeem himself. In all this drama, we witness Raj transforming himself from a tramp who is honest but clad in strange clothing to Prince of Peeplinagar who is suave in his well-cut clothes, dashingly attractive, devilishly delectable but morally corrupt with amazing ease. Equally good was Nargis as Vidya: who could forget that heart-breaking moment that she plays sitting serenely in the veranda of her house softly singing those poignant lines Yaad aati rahii dil dukhaati rahii … or her face, particularly, eyes that reflect a mixture of rapture, of gravity, of subtle presence that is beyond words to describe. Marvelling at Nargis of this scene, who can fail to recall that iconic romantic song: Pyar hua ikraar hua ….that prelude of violins in quick phrases like that of gushing monsoon winds through woods, suddenly interrupted by a thunder followed by matching short and sweet sounding mandolin breaks followed by violin phrases in quick succession with intermittent weighty theka of dholak setting a fast rhythm…. As we listen to this apparently innocent looking question—Pyar se phir kyoon darrta hai dil—it invariably challenges our wit. True, Pyar is something to be happy about, to be cherished, to feel proud about, for finding a love interest is in itself a great accomplishment. So, it’s so natural to wonder: “Why the hell heart is then fearing about it?” but once the words— Pyar se phir kyoon darr ta hai dil—sinks in mind, one’s heart perhaps stirs, indeed they rock the heart with myriad questions: Would it be successful? Would I be able to stand to its dictates? Would I be able to deliver all that is expected of me under the relationship? Would the other party reciprocate …? Would I be able to infuse trust into the relationship? Would I be able to grant allowances for the other party’s inadequacies? What if it fails? Those were the myriad questions that Shailendra’s apparently innocuous lyric Pyar se phir kyoon darrta hai dil raise… Suffice to say, there are many known and unknown ‘unknowns’ in that ‘Pyaar hua ikraar hua hai’-status. Hence the vagueness. And it is that imprecision, which is perhaps, the root cause of fear. And, interestingly when it comes to the turn of Nargis, she, with her amazing eyes reflecting a mixture of ecstasy, tenderness and certainty capturing the whole attention of audience, sings with a face that is quite reflective of the unknown fear, her natural apprehensions in a more clear terms … indeed, delivers them with exceptional panache…. See, how categorical Shailendra is when it comes to the turn of the lady love: he presented her as a better knower of the ‘unknowns’. Responding to Raj Kapoor’s undefined fear, she comes forward with a very clear definition of her fear: “Kehata hai dil rasta mushkil / Maaloom nahin hai kahan manzil. This reminds us of what Sudraka said about women in his play, Mrichchhakatika: “Streeyom hi naam khalveetaa nisargaadev panditaaha / …“Women as a whole are wise by nature; while wisdom is acquired by men only by the study of Shastras” (4.18). Ha! What a visualization of Raj and his direction…. And that great actress’s expressions! So natural and charming… To cap it all: that great poet, Shailendra and his sweet and simple lyrics but rich in thought; singer Lata, Mukesh and the stalwarts: Shankar and Jaikshan! Cumulatively, all this romanticized populism made his Shree 420 stand out as an all-time classic in the world of Indian films. And it is through such translation of the ideological sentiments into melodramatic cinemas—Awaara, Boot Polish, Jagte Raho, Shri 420, Jis Desh Men Ganga Behti Hai—that Raj, the ‘multi-faceted’ genius remained etched in the minds of Indian movie goers as the showman of the Indian film world.